By Mauricio Alvarez-Mesa, PhD— Spin Digital HEVC Encoder (Spin Enc) introduced support for 8K broadcast format (ARIB STD-B32 version 3.9) in its latest version (v1.8). In this blog entry we explain in more detail the meaning and applications of the ARIB STD-B32 compatibility. STD-B32 is a standard developed by the Association of Radio Industries and Businesses of Japan (ARIB). The standard specifies “Video Coding, Audio Coding and Multiplexing for Digital Broadcasting” [ARIB-2018]. An important application of STD-B32 is the broadcasting of video in 8K resolution for the Japanese Super Hi-Vision format. For 8K resolution STD-B32 specifies a mandatory picture partitioning using 4 slices. Wavefront Parallel Processing (WPP) is allowed but not mandatory, and Tiles are not allowed. The specified layout is described in Figure 1. Figure 1. Picture Partitioning in 4 slices as specified by ARIB STD-B32. Picture taken from ARIB. 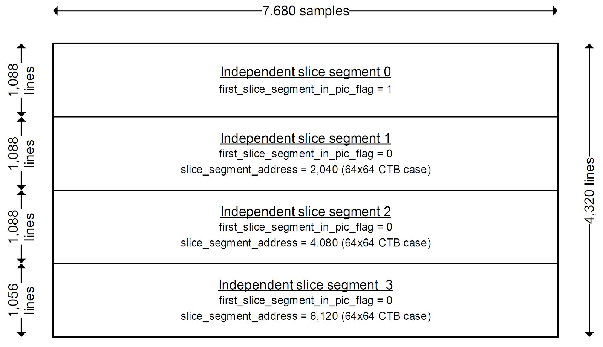 Filters (deblocking and SAO) across slices borders are defined to be available as well as inter-prediction over slice borders. For the latter, the standard specifies a motion vector restriction across slice boundaries. Spin Digital HEVC Encoder (Spin Enc) supports the picture partitioning specified in the ARIB STD-B32 standard for 8K format. Playback of ARIB-enabled streams has been tested with compatible HEVC decoders and players. Spin Digital HEVC Player (Spin Player). Spin Player supports the HEVC standard using Spin Digital’s HEVC software decoder. Spin Digital’s decoder is a high performance CPU-based solution, that can process HEVC files with any picture partition (tiles, slices, WPPs), including the ARIB 4 slices format. Socionext S8 Player (S8 Player): Socionext has developed a player, called S8, based on a hardware HEVC decoder solution. S8 player supports ARIB STD-B32 picture partitioning only. Spin Digital HEVC encoder streams have been tested successfully for compatibility with S8 player. (Note: testing has been performed by third parties not directly by Spin Digital). The ARIB STD-B32 standard specifies, among others, the video coding parameters for the 8K video system begin used in Japan for the new Super Hi Vision format. STD-B32 defines a mandatory picture partitioning method based on HEVC slices with particular restrictions. Spin Digital HEVC Encoder (Spin Enc) added support for this picture partitioning mode. Playback of Spin Digital’s HEVC streams with STD-B32 support has been tested on Software (Spin Player) and hardware (Socionext S8) media players. [ARIB-2018] ARIB. STD-B32. Video Coding, Audio Coding and Multiplexing Specifications for Digital Broadcasting. July 2018.